Find a vacation home to rent in Decentralized Administration of Peloponnese from our list of vacation rental properties. Campaya has over 88 vacation homes available in Decentralized Administration of Peloponnese, which give you the possibility to locate a unique accommodation in Decentralized Administration of Peloponnese which completes your check-list in search for the perfect self catering vacation apartments in Decentralized Administration of Peloponnese or vacation villas in Decentralized Administration of Peloponnese. This secluded Campaya Holiday pool house GPE361, is located just outside of Ziria village in Peloponnese. This semi-detached house is divided into 2 apartments (see also GPE190). The grounds are shared. This apartment is located on the first floor. This amazing stone villa with shared swimming pool is the best choice if you need quiet holidays, with all the luxury you deserve. This magnificent villa is the best choice when it comes to family holidays. It is built in a big garden among trees and is situated in the town of Koroni. Located right in front of the beach this lovely first floor apartment can accommodate up to 8 persons. Your accommodation with private pool is built only 500m away from the amazing sandy beach of Methoni . This semi-detached house is well maintained and offers air conditioning in the living room and a splendid panoramic view of Kalamata and the Messinian Bay. Right in front of the sea this summer house is surrounded by 800 sqm garden, providing the modern details and qualities of a fully equipped holiday home. Located in the area of Mani Peloponese, this exquisite villa GPE353, is a unique rental for your family. Situated only a few km from the center of one of the most cosmopolitan areas of Peloponnese, in Porto Heli this beautiful house will be the perfect choice for your holidays. 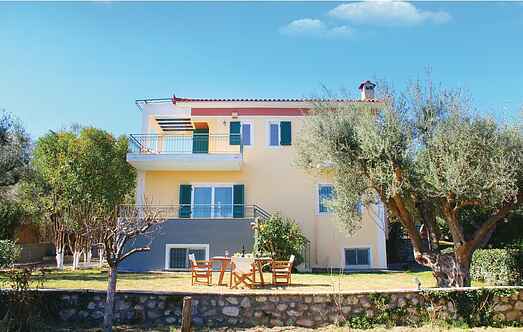 This vacation rental is located in one of Mani’s famous villages, Areopolis. Build out of stone and wood, GPE347 represents a classical architectural example of the houses of Mani. This is a peaceful place: the tiny village of Vrousti has altitude almost 700 meters and approximately 40 inhabitants.